When "metadata" became breaking news, appearing in stories about surveillance by the National Security Agency, many members of the public encountered this once-obscure term from information science for the first time. Should people be reassured that the NSA was "only" collecting metadata about phone calls -- information about the caller, the recipient, the time, the duration, the location -- and not recordings of the conversations themselves? Or does phone call metadata reveal more than it seems? 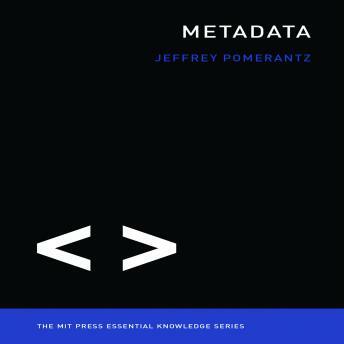 In this book, Jeffrey Pomerantz offers an accessible and concise introduction to metadata. In the era of ubiquitous computing, metadata has become infrastructural, like the electrical grid or the highway system. We interact with it or generate it every day. It is not, Pomerantz tell us, just "data about data." It is a means by which the complexity of an object is represented in a simpler form. For example, the title, the author, and the cover art are metadata about a book. When metadata does its job well, it fades into the background; everyone (except perhaps the NSA) takes it for granted. Pomerantz explains what metadata is, and why it exists. He distinguishes among different types of metadata -- descriptive, administrative, structural, preservation, and use -- and examines different users and uses of each type. He discusses the technologies that make modern metadata possible, and he speculates about metadata's future. By the end of the book, listeners will see metadata everywhere. Because, Pomerantz warns us, it's metadata's world, and we are just living in it.